Michael Fassbender was planning a well-earned break surfing the Australian waves when Aaron Sorkinai??i? ?s script for Steve Jobs arrived and changed his plans. It was, he says, ai?? ?simply too good to turn downai???. Sorkinai??i? ?s compelling story is a take on the life of Steve Jobs, one of the co-founders of Apple and a man who helped shape the way we live. 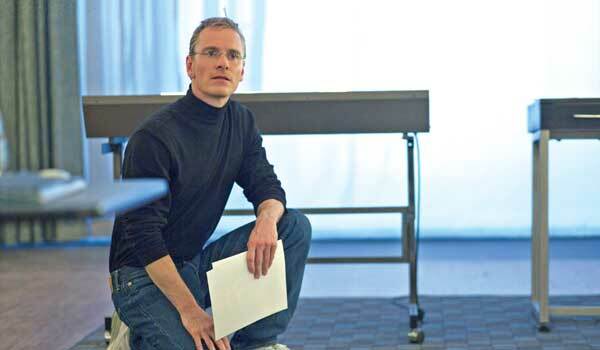 Directed by Academy Award winner Danny Boyle, Steve Jobs is set over three acts. For Michael, personally, it represented a massive challenge of trying to portray Steve Jobs, the global icon, as a human being, interacting with the most important people in his life andAi?? learning huge chunks of Sorkinai??i? ?s razor sharp dialogue. Hereai??i? ?s more, from Michael himself. Steve Jobs has been described as both a hero and an antihero. How do you see him? I never really spent much time thinking about it. I think he was somebody that changed the way we live our lives, in so many different ways. Thatai??i? ?s the kind of person that I was trying to fill the shoes of. The good and the bad come with it. I treated him like a human being. How extensively did you research the man? The other actors had the advantage of portraying living characters who they could speak to. I watched whatever was available on YouTube, and googled interviews. If I wasnai??i? ?t filming, I was at home learning lines. Were you concerned that you donai??i? ?t look enough like Jobs? I did think to myself, ai?? ?Jeez, I donai??i? ?t look anything like this guy, so how is that going to work?ai??i?? But I met up with Ivana [Primorac], and Danny and then we sort of said, ai???weai??i? ?re not going to try and do that at allai??i??. I think audiences accept things when you lay them out clearly for them. So, at the opening of the film, you see I donai??i? ?t look anything like him, and you go, ai?? ?He doesnai??i? ?t look anything like him. We can get over that now and watch the rest of the movie.ai??i?? We just put our faith in that. Then, as we were going, and we were filming the second act and getting to the third, I was like, ai?? ?you know what, Iai??i? ?d really like to wear the polo neckai??i??. Are you personally interested in technology? What apps do you use? Iai??i? ?m actually pretty awful with technology, which is kind of ironic. Doing this film has made me realise that with iPhones, itai??i? ?s like an extension of us now; itai??i? ?s like an extra limb. People start to suffer from anxiety if they donai??i? ?t have their phone, so obviously itai??i? ?s intrinsic to the way we live now. Steve Jobs premieres on Sony Pix, on January 29, 1 pm and 9 pm.